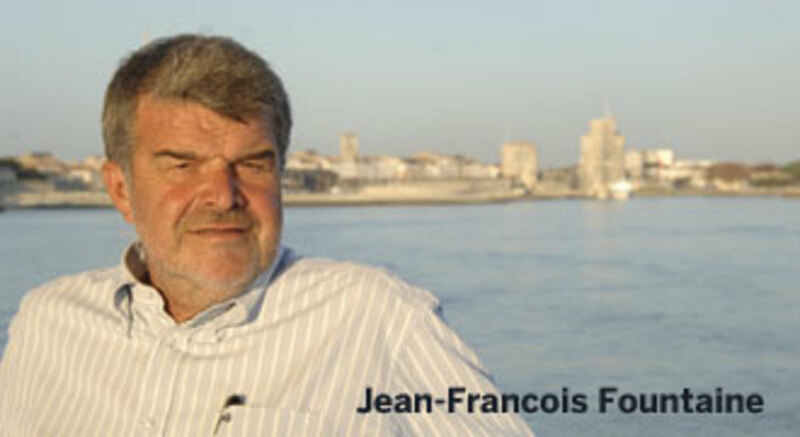 Jean-Francois Fountaine prepares a fresh, raw oyster that disappears in his Homeric hands. He tilts his head back slightly to slide the mollusk into his mouth, his eyes never losing contact with mine, his presentation about Fountaine Pajot never ceasing. We’re having a late dinner in a seafood restaurant in La Rochelle, France, where fresh, simply prepared ingredients are served over several courses. Chatter about sailing misadventures swirl from the far end of the long farm-style table, while at the other end Fountaine’s wife, Claire, and I share our favorite British Virgin Island anchorages. In between, I continue to discuss power catamarans with Fountaine, while the waitress squeezes in and out of the quaint space. She seems infinitely annoyed that I’m taking up too much square footage. In a few minutes Fountaine will be off to his next meeting, but before he leaves he wants me to really understand his company. Fountaine has been called a pioneer, an innovator, an advocate, and a feisty competitor. He stands at about 6-foot-2, with a large frame, his unshaven face sporting a natural look that Brooklyn beatniks try to achieve with immense effort every morning. He sailed in the 1976 Montreal Summer Olympics and began building IOR racing sailboats shortly thereafter. In whatever language he speaks, he does so in a soft, professorial, and deliberate tone, all the while a mischievous smile percolates just below the surface. And oh yes, the company that he founded with Yves Pajot in 1976 is one of the leading catamaran builders in the world today. “You know, we only build catamarans and there is a lot to it,“ he says, his hands now busy disassembling a plate of prawns. 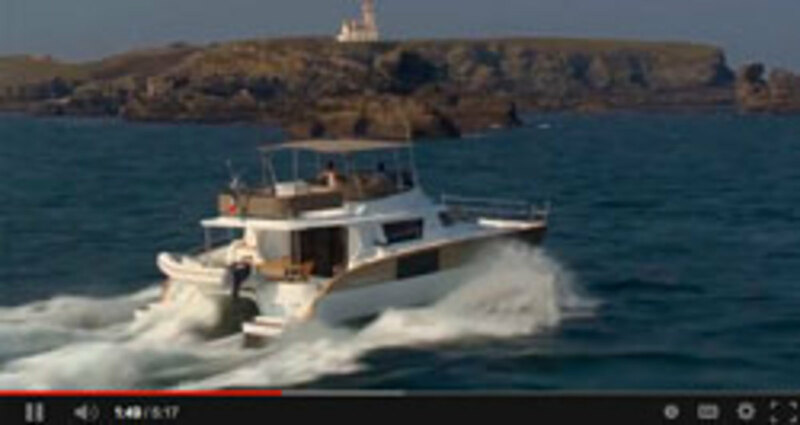 Indeed there is a lot to building and designing good, seaworthy catamarans. 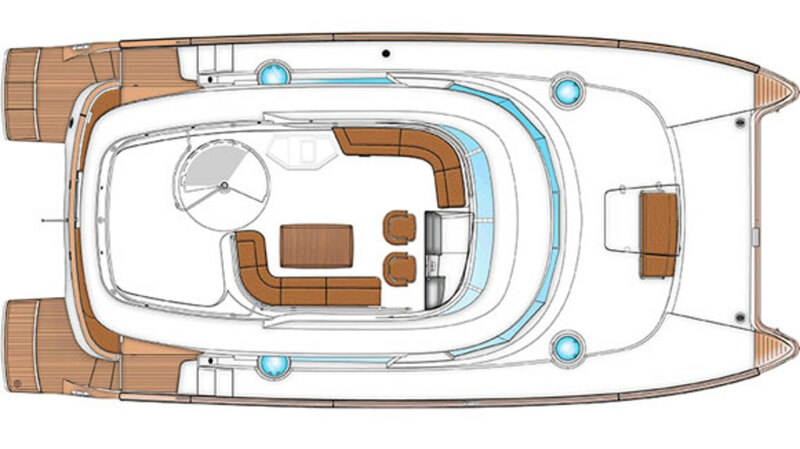 The company’s new Cumberland 47 LC is not simply a regurgitated sailing cat sans mast. 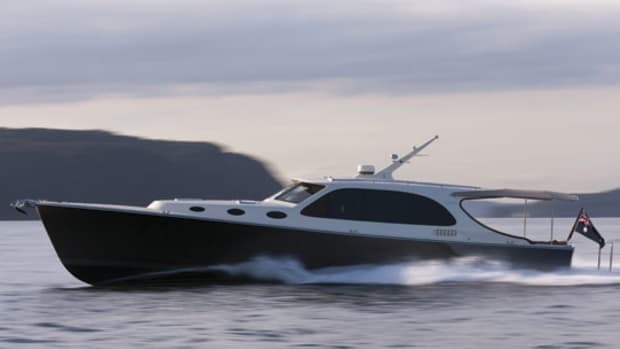 It is a purposely designed motoryacht from the board of Joubert-Nivelt, the French design powerhouse led by Michel Joubert and Bernard Nivelt. The firm is a leading force in the competitive sailboat racing market, as well as a player in the larger cruising powerboat market. The 47’s hulls and their interconnecting web form a tunnel that’s rounded in the after sections. This encourages the nozzling of water between the sponsons but allows it to evacuate through the stern with ease. During our test in a blustery Bay of Biscay, we power into sizable, short, head seas at 15 knots with no hard motion, pitching, or slamming. Also, the forward chine on each hull extends aft from the stem to just about amidships, helping to keep spray down. We take some water over the bow, but believe me—we were in snotty weather. 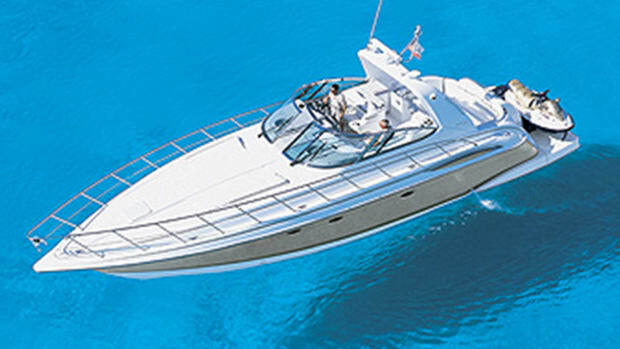 Power on our test boat was a pair of 300-metric-horsepower Volvo Penta D4 diesels. These are an optional $23,640 upgrade over the 225-metric-horsepower version of the same model. I’m a fan of this engine, which was reintroduced in the electronic version in 2010. First of all, it’s purpose-built for the marine environment, versus an application that flows down from the truck industry. The compact footprint features a common-rail system, with double-overhead camshafts, 4 valves per cylinder, and turbocharger. The double-overhead camshaft design means fewer moving parts, and that’s always a good thing. Of course, the standard 225-metric-horsepower version is a fine choice if you’re willing to give up a little top-end speed. Comparing my data with the company’s report of the smaller horsepower engine, it appears there is a difference of about three knots in maximum speed. 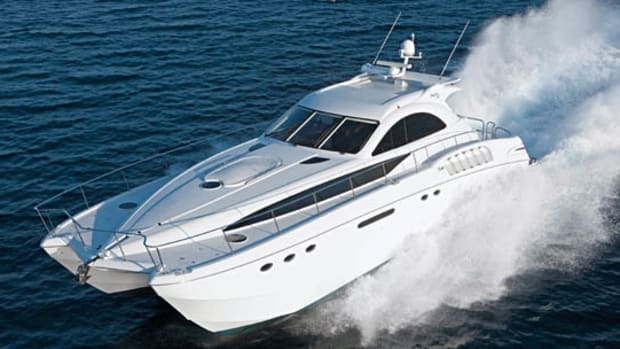 There is a slightly higher “top” cruise as well, although at 15 knots, both versions burn a total of about 12 gallons per hour. 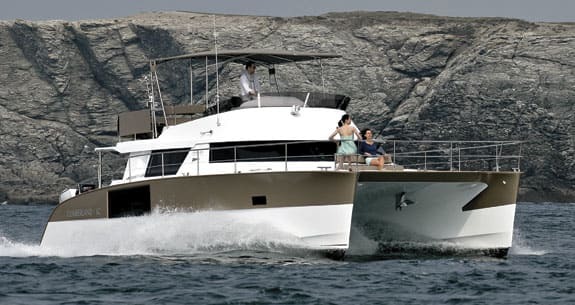 Fountaine Pajot also offers the Volvo IPS system (an $85,800 option), and I must say, I’m not sure if I see the advantages of the forward-facing pod units on this particular boat. In my opinion, the maneuverability advantage is negated by the fact that this boat is already fairly easy to maneuver, as are most power cats with widely spaced props. I would be curious, however, to compare and contrast the efficiency of the straight shaft versus the pods. We take shelter from the gnarly weather at the lower helm, which is well set up for cruising with space for electronics, cruising guides, and paper charts. The arrangement would be improved, however, by having more than just the center wiper, which is slightly offset from the helm position. Granted, the curves of the windshield would make this a difficult installation. Except for two cabinets abaft the helm—slightly obstructing the view astern—the lines of sight are clear. One notable discovery during this portion of the sea trial is how quiet the 47 is throughout the speed curve. If you’re okay with cruising at 9.5 knots, the decibel readings do not go beyond 60. When I peg the throttles to a top speed of 24 knots, my meter strains to climb to 77. Obviously, by placing the engines in the after portion of each hull, you’re going to realize a noise reduction. The builder also designed “hush” boxes that serve as a lid over each engine, yet they still allow for service checks without being removed. As the wind slices the tops of the waves off, we place the boat beam to the building swells. What happens? Nothing. 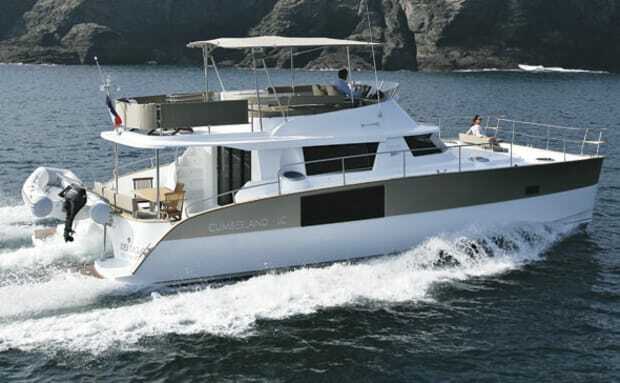 Obviously lateral stability is a benefit to catamaran design and the 47 LC has it in spades. The motion is as steady as a cinder block in a bathtub. Besides competing around the buoys, Jean-Francois Fountaine has shelves lined with silver from various ocean races. His sailing catamarans also have numerous circumnavigations under their keels. And his powerboats give a nod to this bluewater heritage. 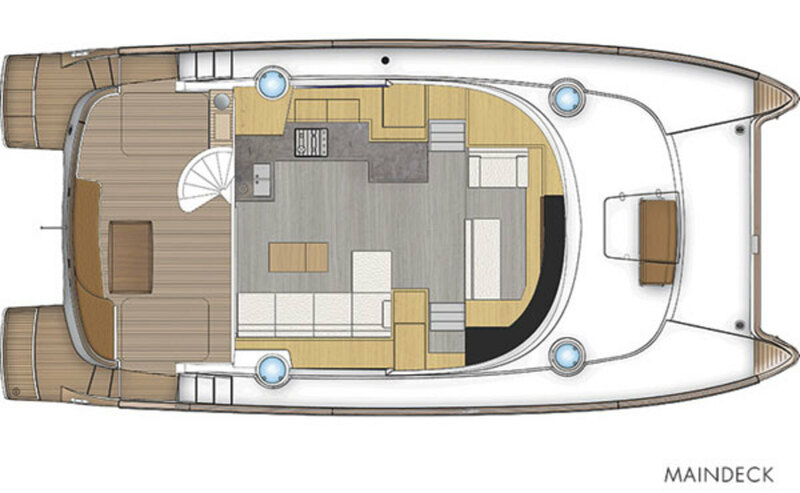 For instance, the side decks are wide with a deep bulwark and teak caprail and a grippy nonskid. The anchoring system is beefy and easy to deploy. The details continue throughout the accommodations. Take the galley as an example. Fiddles border horizontal surfaces (be still my beating heart), there are double sinks to make both prepping meals and clean-up so much easier, and the stove is propane. So there’s no need to run the generator or use an inverter to make morning coffee. In addition, brackets secure pots on the back burners to allow cooking while under way, and a handrail lines the counter for an added element of safety. 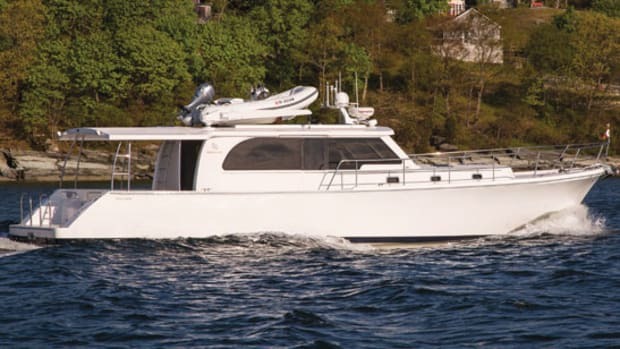 The galley takes up the bulk of the port side, and is huge with plenty of fridge and freezer capacity and stowage to allow several weeks between provisioning for the average cruising family. Indeed, if you take the throttles back to a little less than 7 knots, the 47 nearly has Transatlantic range. 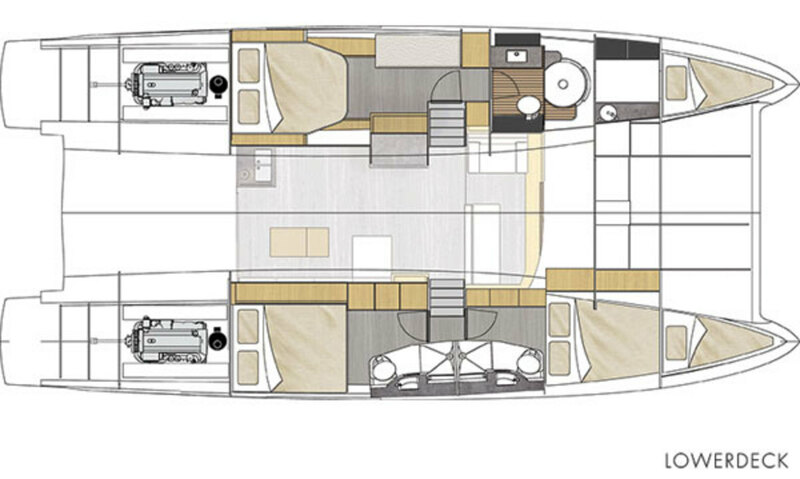 Thanks to the 21-foot 6-inch beam, the saloon and galley area feel like a 60-foot monohull’s. 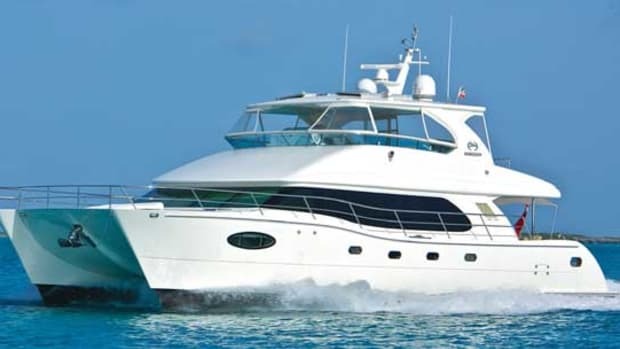 Our test boat is the “Owner” version with the master accommodations taking up the port-side hull and two en suite guest staterooms lining the starboard hull. I like the optional crew cabin forward of the master head on the port side. This is the ideal kid’s cabin, especially for toddlers who may need to be kept closer to their parents. A four-stateroom version is available where the port hull mirrors the starboard hull. The mold shop is massive and I see the tooling for the new 67-foot sailing cat, and I also get a chance to look at the other powerboats in the line, the Summerland 40 and the Queensland 55. 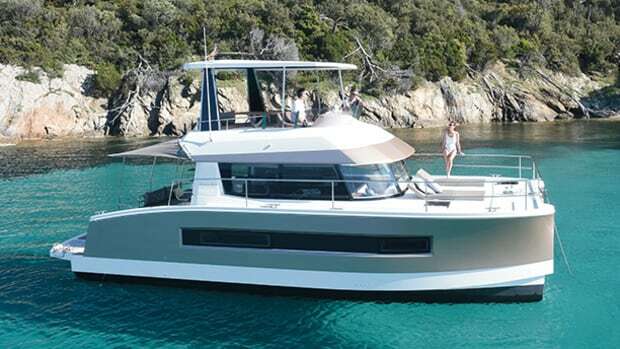 The powerboat designs benefit from Fountaine Pajot’s expertise in keeping weight in check on its sailing yachts. 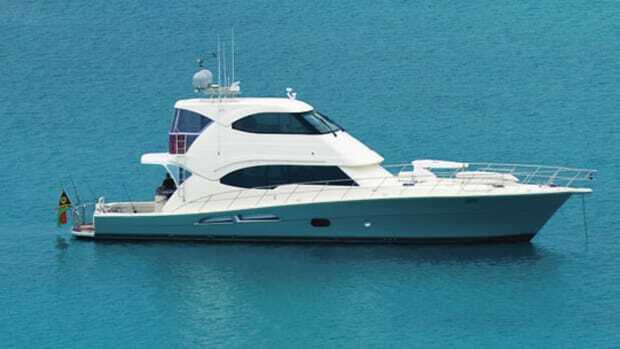 The builder incorporates resin-infusion for the hull, deck, and superstructure. (One reason for such a clean working environment.) This process ensures a solid bond between the fiberglass and the closed-cell foam core. The consistency in resin distribution eliminates possible voids, and also ensures that the builder can achieve the intended part weight with much more precision. All bulkheads and structural components are installed while the hull is still in the mold to ensure a more rigid structure, and the Kevlar composite fuel tanks are also integrated into the hull structure. Both halves of the two-part hull mold are sprayed with isophthalic gelcoat in a strictly controlled process. Throughout the layup process, core samples are taken and resin batch tests are completed to ensure quality-control standards are met. Many Foutaine Pajot models enter the charter market in tropical destinations and after seeing older models in the Caribbean during my cruises, I can confirm that, even after years and years, the glasswork of these boats still holds up and often looks as good as the day it left the factory. Jean-Francois Fountaine washes down his last bite with a few swigs of Bordeaux before gathering his worn briefcase to leave. “We really believe there is growth for us in powerboats,” he says, as he stands to put on his coat. After spending time on the 47 and in the factory I have no reason to disagree him. And then he excuses himself, nodding at all his guests, and heads off into the dark streets of La Rochelle searching for his next challenge. I’m looking forward to seeing what it will be. 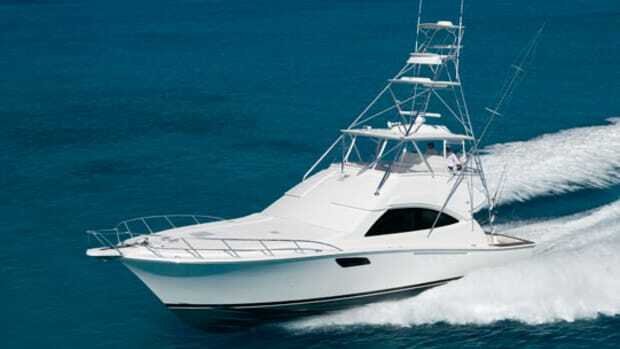 This builder of oceangoing sailboats offers a package designed to allow more time on the hook with less time running the generator. 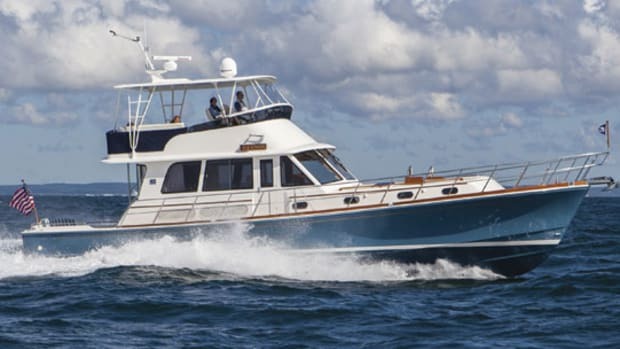 For an additional $9,204, you get Back Contact solar panels located on top of the 47’s bimini, and additional AGM batteries. The system is designed to supply power to the vessel’s low-consumption LED lighting and the batteries serving the well-insulated refrigerator boxes. full fuel, full water, 7 persons; light gear.